This recipe is a total rip-off, but damn good. 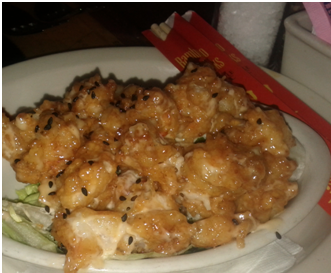 I ate at Bonefish Grill one night with some celebrity chefs…ordered this app called Bang Bang Shrimp…. asked for recipe…. they said emphatically “no”…. spoke to a disgruntled staff member b4 I left…they told me where to get it…. found it…. tried it…. altered it! And here you have my version – renamed after my favorite female voice in the world that almost nobody knows – Beth Hart. Beth released a disc and song of the same name, ergo I ripped that off too. Check out the song link at bottom of page, as its great listening when you’re cooking this! After my infatuation with this recipe, the above-listed restaurant ended up becoming an NFL Radio sponsor this season, where you can get this dish (x3) for 19.99 – pick up only before game time on Sunday. It’s a “beauty” when you make it on your own. Mix mayonnaise with garlic and Thai Sweet Chili Sauce. Add Sriracha to taste. Dredge the shrimp in cornstarch. Deep-fry the shrimp until lightly brown. Drain on paper towel, put in a bowl and coat with the sauce. Serve in a lettuce lined bowl, top with chopped scallions. Serve with a good IPA.